1 December 2015, at 6:00a.m. Francis de Heer describes the development of the poultry meat industry in Ghana, and the challenges the industry must overcome in future. Up until the mid 1990s, chicken was a special, celebratory meal in Ghana. At Christmas, at Easter and at all festive occasions, chicken was the main item on the menu. And the preference was for live, home-slaughtered chicken. In order to take full advantage of this peculiar preference of the market, poultry farmers timed their production schedules to coincide with the festive seasons’ peak demand. If you went around the food markets in the days preceding Christmas or Easter, you would see busy customers at the chicken vendors’ makeshift stands, bargaining and carrying the prized birds home. Many office workers were able to avoid the market hustle, thanks to poultry delivery vans that delivered orders at workplaces. But how things have changed. From the late nineties, when cheap processed chicken from Europe flooded the market, Ghanaians placed chicken on their regular diet, more out of necessity than choice. Imported processed chicken was far cheaper than locally produced, and it still is. Over the years, local industry players actively campaigned for either hikes in the tariff on imported chicken to level the playing field, or subsidies similar to those which, they claimed, European poultry farmers were enjoying. But even though parliament raised the tariff from 24 per cent to 40 per cent in 2004, this was quickly withdrawn, apparently due to pressure from the multilateral lending agencies that were supporting the Ghanaian economy. Unable to withstand the competition from imported products, most poultry enterprises folded. Some farmers stayed in business by switching to egg production (leading to the current situation in which most feed millers produce layer feed), and a few others managed to stay afloat by producing live birds for the seasonal demand. Imported chicken still accounts for over 80 per cent of the chicken consumed in Ghana, and chicken is now the cheapest, and most popular, meat source in Ghana. At most family meals, at workplace lunches and at funerals and weddings, it is the main item on the menu. Chicken is the main item sold at ‘cold stores’ in the markets. Imported processed chicken enjoys another advantage which the local industry is now gearing up to match. The availability of pre-cut portions, especially thighs, gizzards, leg quarters and wings make for convenient cooking compared to live chicken. The switch to imported chicken was also facilitated by the sharp rises in the prices of fish, which used to be the main protein source. Local fish production has declined sharply over the years due to overfishing and lack of modern fishing gear. Most of the fish consumed in Ghana is imported, and twice the price of imported chicken. Yet another illustration of the popularity of chicken can be seen in the increasing numbers of Chicken Republic and Kentucky Fried Chicken branches in the towns and cities. Today, Ghanaians still celebrate Christmas, Easter and other festive occasions with locally produced live chicken. But they also buy imported, processed chicken for everyday use, because it is the cheapest meat available. Until recently, it seemed as if local poultry farmers would have to survive on producing for the seasonal demand. But things are beginning to change. Last year, Government and industry players launched a Ghana Broiler Rehabilitation Project (GHABROP), aimed at increasing the capacity of the local industry produce the nation’s needs. All units across the value chain, from hatchery operations through processing and marketing are being assisted to function effectively. It is projected that 20 million broilers would be produced by the end of 2016. 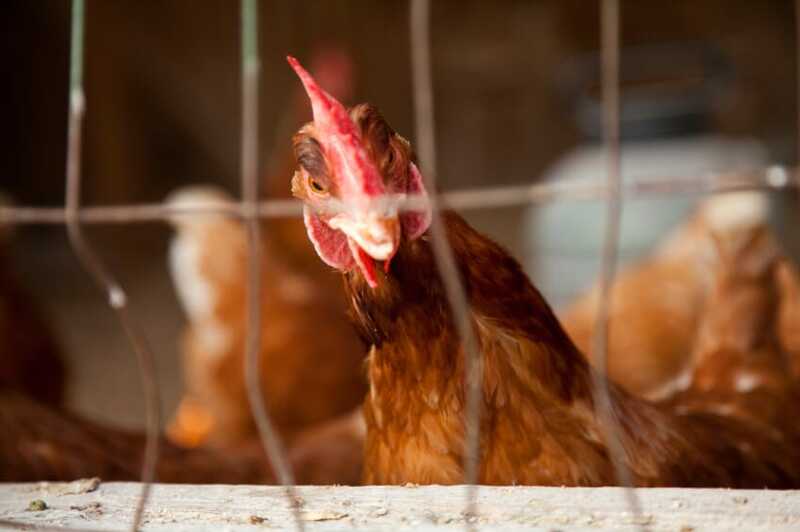 An import licensing regulation was introduced last year, which requires importers of poultry products to source 40 per cent of their products locally. The recent re-launching of the Aribro chicken breed by the Animal Research Institute is expected to reduce the importation of day old chicks. Other measures being introduced include expansion of local feed millers production capacity, installation of processing facilities, and training programmes for workers across poultry enterprises. But there are concerns that the local poultry industry may not be able to produce chicken at modest prices for the local market. Last year, a Dutch businessman who heads the Ghana-Netherlands Chamber of Commerce, Nico van Staalduinen, caused a heated debate locally when he suggested that although Ghana was technically able to produce chicken, the country lacked competitive advantage, and should therefore continue importing chicken and concentrate on her core competencies. To develop world class competency in chicken production, he said, Ghana needed to develop a variety of chicken products specially suited for the local environment. He also argued that since Ghana faced challenges in producing maize, the main feed ingredient for poultry which is also a staple African diet for human consumption, commercial production of chicken was unrealistic. Maize is also a raw material in Ghana’s pharmaceutical and brewery industry. However, the government and the poultry industry are committed to maximising local production. Local poultry farmers believe that imported chicken will prove to be a blessing over the long term. Having enabled Ghanaians to acquire the habit of eating poultry both as a celebratory and regular meal, the local industry only needs to produce large volumes on regular basis to take Ghana back to the situation before the ‘European invasion’. The deciding factor, it would seem, is how much Ghanaians would be prepared to pay for chicken. They may not mind paying premium prices at celebration time, but they would certainly mind paying higher prices for local chicken than imported. The question now is whether the Ghanaian poultry industry can overcome the major production and other challenges and win back the market for chicken. Francis de Heer is a Ghanaian Freelance Journalist and Publisher.